Margaret Sanger opened the nation’s first birth control clinic in October of 1916, which would eventually evolve into Planned Parenthood. Whenever Sanger is mentioned, it is worth remembering that she was a proponent of eugenics (which some debate is decontextualized from the cultural norms of the time) and also that she was firmly against abortion. I also assert that the responsibility for these abortions and the illness, misery and deaths that come in their train lies at the door of a government whose authority has been stretched beyond the limits of the people’s intention and which, in its puritanical blindness, insists upon suffering and death from ignorance, rather than life and happiness from knowledge and prevention. 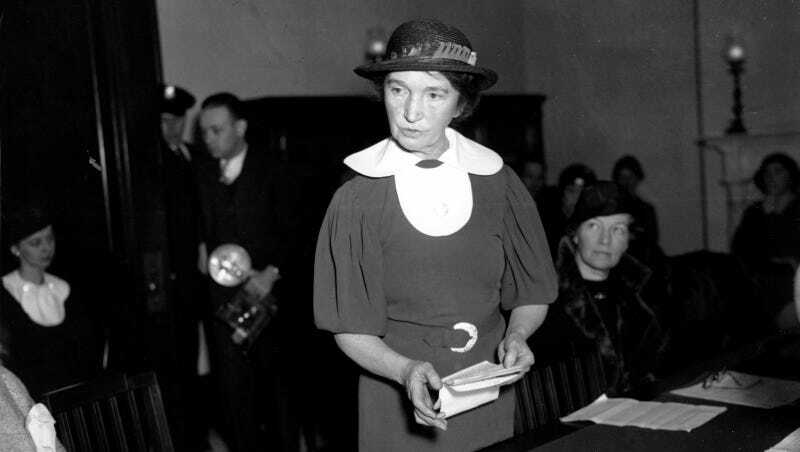 Sanger may have considered abortions a “disgrace to civilization,” but she appeared to have compassion for women who sought them, especially poorer women who she believed did not have the time to recover from the procedure as women in upper classes did. Sanger had the idea that abortions caused a number of ailments, like the “womb may not return to its natural size but remain large and heavy, tending to fall away from its natural position” as well as “barrenness and serious, painful pelvic ailments,” though she may have been referring to the administrations of incompetent back alley abortionists of the time. Image via Sophia Smith Collection, Smith College. I AM A POOR married woman in great trouble and I’m writing to you for help. I was married In June 1915 and I have two children little boy 21 mon & a girl 4 mon and I will be only 17 years old this month and Im in the family way again and Im nearly crazy for when my husband finds out that Im going to have another baby he will beat the life out of me. I love babies but I have had them too fast and have tried everything I could hear of to keep from getting pregnant but everything failed then I have tried several Medicines and have had two bad miscarriages and at last I have broke my health. It seems that if I were to have another one soon that death would be welcome. I am so nervous and these five children are even more than I can handle alone as I can’t afford help. The caption of the Birth Control Review cartoon reads, “Must She Always Plead In Vain?”/Image via New Man Rhetoric. It’s stark and alarming how the difficulty of obtaining safe, legal abortions in the early 1900s mirrors the trials for women seeking abortions today, when the federal government seems hellbent on setting back public awareness of the practice. Women have come far in a hundred years, but when states are proposing bill after bill that complicates the procedure through added expense or unnecessary regulation, it too often feels like we’re running in place.